The genus Hypericum consists of approximately 400 species of herbs and shrubs that have yellow or copper-colored flowers with four to five petals, numerous stamens and a single pistil. St. John’s wort is native to Europe but is commonly found in the United States and Canada in the dry ground of roadsides, meadows and woods. Although not native to Australia and long considered a weed, St. John’s wort is now grown there as a crop, and today Australia produces 20 percent of the world’s supply. Pharmaceutical companies, particularly in Europe, prepare standard formulations of this herb that are taken by millions of people. 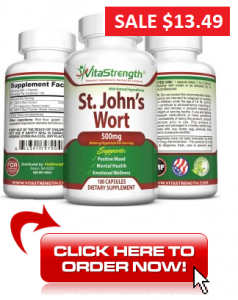 Today, worldwide annual sales of products made from St. John’s wort exceed several billion dollars! St. John’s wort produces dozens of biologically active substances, but hypericin and hyperforin have the greatest medical activity. Other compounds, including the flavonoids rutin, quercetin and kaempferol, also appear to have medical activity. In many studies, St. John’s wort uses seem to work as well as selective serotonin reuptake inhibitors (SSRIs), a popular type of antidepressant that doctors often prescribe first to treat depression, such as Prozac, Celexa and Zoloft. According to the University of Maryland Medical Center, researchers aren’t exactly sure how St. John’s wort works; some have suggested that the herb acts similar to a SSRI because it makes more serotonin, dopamine and norepinephrine available in the brain. These neurotransmitters help improve your mood and can be responsible for treating symptoms of depression. In studies using the rat forced swimming test, an animal model of depression, St John’s wort extracts induced a significant reduction of immobility. In other experimental models of depression, including acute and chronic forms of escape deficit induced by stressors, St John’s wort extract was shown to protect rats from the consequences of unavoidable stress. A study done at the Institute of Psychological Sciences in the United Kingdom included 36 women aged 18–45. They had regular menstrual cycles and were diagnosed with mild PMS. The women were randomly assigned to receive either St. John’s wort tablets at 900 milligrams a day or identical placebo tablets for two menstrual cycles; then the groups switched doses and the next two cycles. Symptoms were rated daily throughout the trial using the Daily Symptom Report, and the women reported on feelings of depression, aggression, hormone balance and hormonal stimulation. 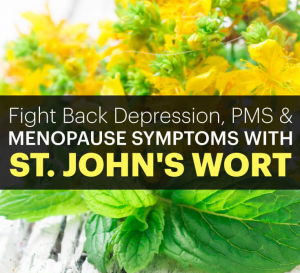 The trials showed that St. John’s wort is superior to a placebo in improving physical and behavioral symptoms of PMS, but there were no significant effects compared with a placebo in treating mood and pain-related PMS symptoms. Researchers reported that daily treatment with St. John’s wort was more effective than placebo treatment for the most common physical and behavioral symptoms associated with PMS, and further work is needed to determine whether pain and mood symptoms benefit from longer treatment duration. St. John’s wort has antibacterial properties and may also help fight inflammation that’s at the root of most diseases. When applied topically, it relieves symptoms associated with minor wounds and skin irritations, working as a natural treatment for eczema, a home remedy for burn relief and a way to naturally treat hemorrhoids. St. John’s wort shows anti-inflammatory properties due to its inhibitory effects on pro-inflammatory genes like cyclooxygenase-2, interleukin-6 and inducible nitric-oxide synthase; these genes play a critical role in chronic inflammatory diseases. Extracts of St. John’s wort have been used for thousands of years to treat cuts and abrasions. Its usefulness in reducing inflammation is well-known and appears to be related to its ability to serve as an antibacterial agent. In a 2003 study at the Department of Dermatology at the Freiburg University Clinic in Germany, 18 patients with eczema were treated twice daily over a period of four weeks. After the trial, the severity of the skin lesions improved on sites of treatment, and skin tolerance and cosmetic acceptability was good or excellent with the St. John’s wort cream. A study done at the Dean Foundation for Health Research and Education analyzed 12 patients who were diagnosed with OCD; the participants were treated for 12 weeks, with a fixed dose of 450 milligrams of 0.3 percent St. John’s wort twice daily. The study included weekly evaluations that were conducted with the Yale-Brown Obsessive Compulsive Scale, the Patient Global Impressions of Improvement Scale and the Clinical Global Impressions of Improvement scale, and a monthly evaluation with the Hamilton Rating Scale for Depression. Significant changes occurred within one week and continued to increase throughout the trial. At the endpoint, five of the 12 patients were rated “much” or “very much improved” on the clinician-rated CGI, six were “minimally improved,” and one had “no change.” The most common side effects reported were diarrhea and restless sleep. Because improvement began at one week, and grew over time, researchers believe that St. John’s wort can be a helpful tool in treating OCD, and more placebo-controlled studies should take place in the future.